I have not listed a quantity for most of the items, this will depend of the size of your group and the medical conditions of your family or group. A good First Aid reference manual and a copy of the new Special Operations Forces Medical Handbook. Self-adhesive bandages (Band-Aids), various types and sizes – to dress minor wounds. Steri-strips (butterfly bandages) – for closing wounds in place of sutures. Triangular bandages – for slings and immobilization of dislocations and fractures. Cotton-tipped swabs – for cleaning wounds, applying salves and ointments. Bandage Sheers/EMT sheers – cutting bandages or victims’ clothing. Tweezers, fine points – for splinter removal. Needles, sewing – to assist in removing foreign material. Oral thermometer I prefer the old mercury thermometers– to check vital signs. Syringe, 60cc or squeeze bottle – for irrigation of wounds. Emergency blanket – for warmth and treatment of shock. If you have room, wool blankets are better. Bio bags – for disposal of gloves and medical waste. You can substitute Ziplock bags. Antibiotic ointment – for wound treatment. I like neosprin. Burn gels and ointments – for treating minor burns. Antihistamine tablets – for allergic reactions. I stock Benadryl and various allergy tablets. Blood stopper powder – for stopping severe bleeding. I like the QuikClot dressings. Hand sanitizer – when you can’t wash your hands with soap and water. This also makes a good fire starter. 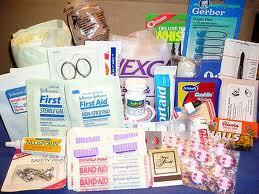 The above items constitute the basic first aid kit. I suggest that you add the following items, even if you feel inadequate to use them. It probably will be easier to find trained people than the medical supplies or you can get the additional training. Separate compete Burn Kit – for treating multiple or very serious burns. Israeli Battle Dressings – one of the best dressings on the market for serious trauma. Blood pressure cuff – to determine victim’s blood pressure. These come in different sizes, be sure you have one that is large enough for the biggest member of your group. Sutures in various sizes – to close serious wounds. Hemostats/Forceps, several – for closing major bleeding vessels or aid in suturing. Scalpel handles and extra blades in various sizes – for removing tissue, minor surgery. Lidocaine and topical anesthetics for tattooing. Desitin ointment – for treatment of rashes and sore areas. Duct Tape – This can be used to stabilized injured patients, if you have to move them and also to hold on dressing. Many medical supplies need to be rotated; some have a “limited” shelf life. I personally do not pay a lot of attention to expiration dates on most medications. I figure that they will last several years past the dates. But what you need to be aware of is those items that people don’t often realize have a limited life span. Latex or nitrile gloves have a short life, especially in hot environments like a car. Check them at least once a year and replace when necessary. Another item with a short life time is band-aids. As band-aids get older, heat and age tends to breakdown the adhesive and it loses its cohesive strength. If a self-adhesive bandage can’t “stick,” it really serves no purpose. Remember to check your medical supplies at least once a year and replace anything you have doubts about. This entry was posted in Uncategorized and tagged medical supplies. Bookmark the permalink.